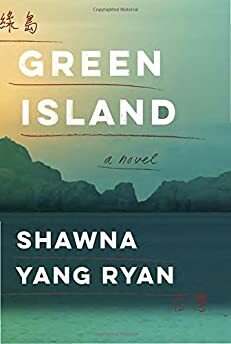 Largehearted Boy: Book Notes - Shawna Yang Ryan "Green Island"
Book Notes - Shawna Yang Ryan "Green Island"
Shawna Yang Ryan's novel Green Island is an epic story of Taiwan's post World War II history that brilliantly blends the political with the personal. "Absorbing and affecting, this powerful tale explores the bond between a father and daughter, the compromises they are forced to make, and the prices they pay in their quest for freedom." Green Island follows a family in Taiwan and California over the span of six decades—a lot of music to cover! My playlist for Green Island is not necessarily historically faithful but rather an attempt to capture some of the emotional tones of the novel, which I have traced out roughly chronologically here according to the book's events. 1. "Landslide" (Fleetwood Mac)—Firstly, I love the melancholy and moodiness of the song. However, more particularly, Green Island centers on a complicated father-daughter relationship and a daughter struggling to free herself from the legacy of her father's decisions. Stevie Nicks has said in various interviews that "Landslide" was written for her father and so, in addition to the tenuousness described in the song, I've come to think of it as the story of a father-daughter relationship. In a 1992 interview, Nicks says, "I realized then that everything could tumble, and when you're in Colorado, and you're surrounded by these incredible mountains, you think avalanche. It meant the whole world could tumble around us and the landslide would bring you down. And a landslide in the snow is like, deadly. And when you're in that kind of a snow-covered, surrounding place, you don't just go out and yell, because the whole mountain could come down on you." 2. "The Wandering Songstress" (Zhou Xuan)—This is a 1937 Chinese song, not Taiwanese, but for me it evokes the 1940s, the era in which the book begins. It evokes pre-war China, and also signals to me the impending collision of China and Taiwan that was to take place after the end of World War II—the moment when everything for my characters changes. This song was on my playlist for Water Ghosts as well—I guess it's a song I can't let go of! 3. "Tian Mi Mi" (Teresa Teng)—Taiwan-born Teresa Teng was the most popular Mandarin-language singer in the world during her heyday. Her untimely death—of asthma while on vacation in Thailand at the age of 42—only cemented her legend. Teng was so iconic that Taiwan used her image in the propaganda that they sent over to China during the 70s. My narrator says, "On alternating days, we sent—packed in buoyant Styrofoam—canned rations with labels reading OPPOSE COMMUNISM, bright color postcards with pictures of life in Taiwan promising fish, freedom, and singer Teresa Teng—the true promise of liberation clad in sequins and hairspray—while the Chinese sent over leaflets with round-faced, smiling families that promised the beauty of the 'ancestral land.'" The lyrics are also appropriately evocative of the moment when the narrator meets the man she will marry. "Where, where have I seen you before?" Teng sings. "In my dreams, in my dreams I saw you." 4. "(I Can't Get No) Satisfaction" (The Rolling Stones)—In the 1970s, the Americans were in Taiwan and a secondary service economy emerged. My narrator works in a restaurant that caters to GIs and goes to GI bars with her friends. This Rolling Stones song evokes the club scene of that era. 5. "Coming to America" (Neil Diamond)—Green Island is also an immigration narrative. In 1972, the narrative moves to Berkeley, California with her new husband. America promises them an escape from the oppressive government of Taiwan, but they find that the American dream is not yet what they expected. 7. "The Blower's Daughter" (Damien Rice)— This is a song that is more musically evocative than lyrically representative of the story. I can't give away any spoilers (! ), but the narrator loses someone important to her, and even without the lyrics, this song radiates loss. 8. "(Just Like) Starting Over" (John Lennon)—The novel moves into the early 80s when narrator's marriage encounters a rough patch (again, trying to avoid spoilers!). In this 1980 song, Lennon—as half of one of the most famous couples in pop culture history—sings about the rekindling of a relationship. The lyrics, together with the footage of him with Yoko and Sean that make up the music video, evoke so much about love and commitment. 9. "Green Island Serenade"—This list must end with the "Green Island Serenade," the song from which the book takes its title! There are multiple stories about the origins of this song—some people claim it's a simple love song and others say it was written in Taiwan's notorious prison on Green Island. In either case, the song's question: "Darling, why are you still silent" says not only so much about love, but also much about politics and about complicity. How much do we dare speak up for the principles we believe in? This is a timeless question that extends beyond Taiwan and its history.